- Vol. 1, no. 1 (Sept. 8, 1945)-v. 1, no. 19 (Nov. 9, 1945). - Published at Gila River Relocation Center by the War Relocation Authority. Gila Bulletin . [Rivers, Ariz] (Rivers, AZ), Sep. 19 1945. https://0-www.loc.gov.oasys.lib.oxy.edu/item/sn83025352/1945-09-19/ed-1/. 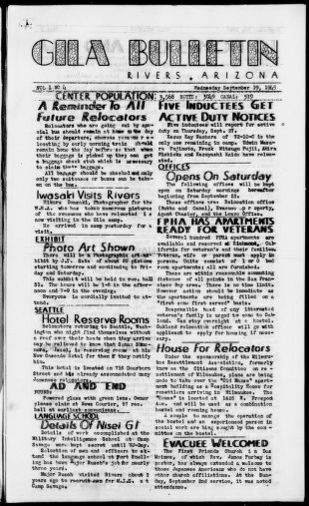 (1945, September 19) Gila Bulletin . [Rivers, Ariz]. Retrieved from the Library of Congress, https://0-www.loc.gov.oasys.lib.oxy.edu/item/sn83025352/1945-09-19/ed-1/. Gila Bulletin . [Rivers, Ariz] (Rivers, AZ) 19 Sep. 1945. Retrieved from the Library of Congress, www.loc.gov/item/sn83025352/1945-09-19/ed-1/.